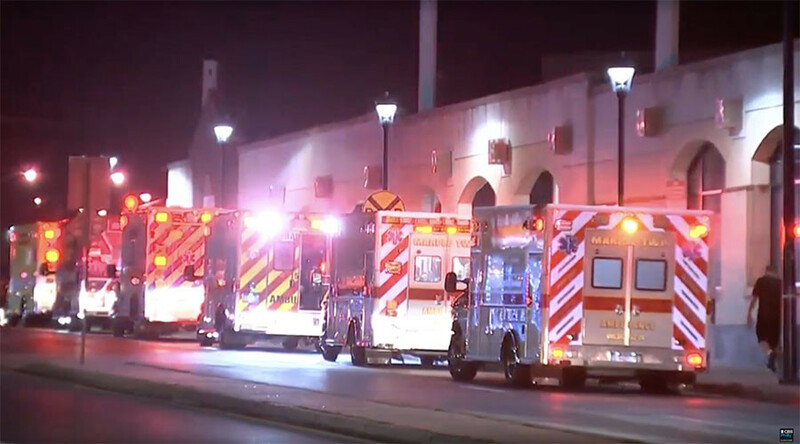 Forty-two people have been taken to the hospital after a train plowed into another train sitting at a Transportation Center in Upper Darby, although none of them are thought to have life-threatening injuries. The incident occurred around 12:15am on Tuesday, the Southeastern Pennsylvania Transportation Authority (SEPTA) said. An inbound Norristown High Speed Line train crashed into an unoccupied, parked train at the 69th Street Terminal in Upper Darby, Heather Redfern, SEPTA spokeswoman, said. According to SEPTA, 33 people aboard the moving train sustained injuries. At least four people were seriously injured, according to initial reports, including the train’s conductor. “The conductor is in the hospital right now, I can't release his condition,” Upper Darby Mayor Nicholas Micozzie told an early morning news briefing. The victims were rushed to nearby hospitals. Several hours later, it emerged that none of the people were critically injured and in fact the conductor had already been discharged from the hospital. "Some were considered walking wounded," said SEPTA spokeswoman Heather Redfern. “I stood up to get off to get ready to get to my bus on time and smack! It hit the other trolley, parked,” one passenger told CBS Philly. “My face hit the wall, put a big hole in the wall and I went straight down and I blacked out,” he added. Service disruptions are expected for the Tuesday morning commute, SEPTA said. In late February, two commuter trains collided head-on in Philadelphia, injuring four people. That crash happened near the 69th Street Terminal during the city’s busy morning commute. The trains were empty when they collided, but minor injuries occurred when one of the cars toppled on to a separate parked car where a homeless man was staying. All the other injured parties were reported to be workers from SEPTA, which is investigating the accident. According to spokeswoman Heather Redfern, Norristown train services have resumed but passengers can expect some delays.